New ILO Member Serving Kawartha Lakes Coming Soon! Drivers need to be watchful for cyclists particularly in the summer months. Car accidents happen for a number of reasons ... distracted driving, speeding, impaired driving and faulty vehicle mechanics are all factors that can easily increase the probability of a car crash. In a study conducted by the Canadian Council of Motor Transport Administrators (CCMTA) 'Speed and Intersection Safety Management' during the years of 2002-2004, car accidents at urban intersection areas accounted for over half of all fatalities and almost three quarters of all serious injuries. Many cycling accidents occur under these same circumstances, however, cyclists are far more likely to die or sustain severe injuries than a passenger in a vehicle. Serious injuries that can be sustained from motor vehicle/car accidents at intersections include brain injury spinal cord injury, disability and catastrophic injuries. A recent car accident at an intersection in Peterborough added to the growing number of collisions. Two women were in need of medical care and assessment after they were injured in an early morning car accident at the Clonsilla Avenue and Goodfellow Road intersection. The roof of one of the vehicles had to be cut off in order to free a driver who was trapped inside. Over thirty thousand dollars in damage was caused to both vehicles involved in the accident and a twenty-eight year old woman was charged with failure to stop at a red light in connection with the accident. In another car accident in mid-July 2015, a driver became trapped inside an overturned vehicle. This occurred in the early afternoon on Pigeon Lake Road. After the lone occupant in the single vehicle accident was transported to the hospital it was determined that the injured driver was under the influence of alcohol. The seventy-five year old driver was arrested for impaired driving after being discharged from the hospital. Cyclists are especially vulnerable to being hurt in car accidents. Spring and summer in the Kawartha Lakes area usually heralds the season of bikers, both motorcyclists and cyclists. Research shows that the most cycling fatalities actually occur on beautiful days (clear, dry and in daytime) during spring and summer (http://www.sharetheroad.ca/files/Cycling_Safety_Overview___2012_12_05.pdf ). Motor vehicle drivers are cautioned to be very attentive of cyclists, especially when opening parked car doors and making turns. The most frequent cause of cyclist collision occurs when a driver is making a right turn and unaware of a cyclist passing along his/her right side. In early July 2015, a woman was injured and taken to Ross Memorial Hospital after coming into violent contact with a car door while riding. Common injuries sustained from this kind of accident include head, neck, spinal cord injury and sometimes death. According to the Preliminary 2013 Ontario Road Safety Annual Report, there were seventeen bicyclist fatalities and over two thousand incidences of cyclist injury ranging in severity, for that year. It is important for everyone’s safety that we all take the necessary care and precaution when driving or when carrying out our daily routines. It is very easy to become seriously hurt while doing something as innocent as biking to the corner store for a loaf of bread. The physical and emotional trauma from an accident can linger with an accident victim and their family for years. This can be a very challenging and stressful period that can change a person’s life and it is important that you are professionally represented during this time of injury and recovery. The Injury Lawyers of Ontario (ILO) team has experience in handling cases for victims who have suffered injuries from motor vehicle accidents, whether as cyclists, pedestrians or as a vehicle occupant. 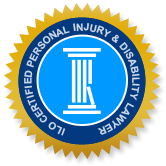 We also offer legal assistance and representation to anyone who has been injured in other actions, such as slips and falls, recreational accidents, wrongful death and product liability. Our personal injury lawyers are well versed in the strategic application of the law and will fight to get you your just compensation.